I’m anxiously waiting for the warmer weather to get here so I can bring my baby to beach. He’s at such a fun age right now and I know he will be thrilled with the water and sand. 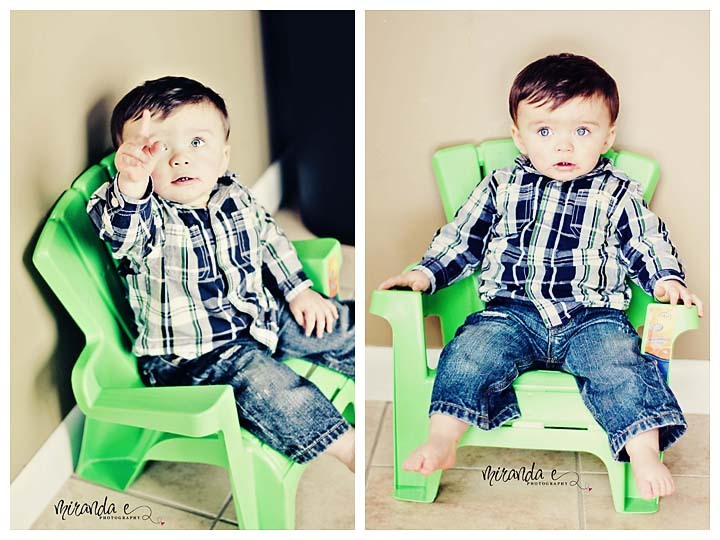 When I was in Toys R Us – there is a Babies R Us section in it and I buy Earth’s Best organic food there – and I saw this chair that was perfect for my little man. It’s just a little plastic chair but it was the best $5.99 I’ve spent in a long time. He absolute loves it and sits it in all the time. Like a king on his throne. When I first brought the chair home he sat in it for over a half hour without trying to get out. It looks funny in the middle of my living room but oh well. If it gets him to sit still it can stay! You can see that he has a “dirty” face. It’s amoxicillin that never made it in his mouth. I sat him in the chair to attempt to give him his medicine. I was going to edit it off his face but I actually kind of like it there. It is real life.